“History Detectives: Researching the History of Your House” will be presented by Susan Lankford, Director of the Ball State University Center for Historical Preservation, on Tuesday, November 30 at 7:30 p.m. in Bracken Library, room 104. This free program is sponsored by the Friends of the Alexander M. Bracken Library and is open to the public. 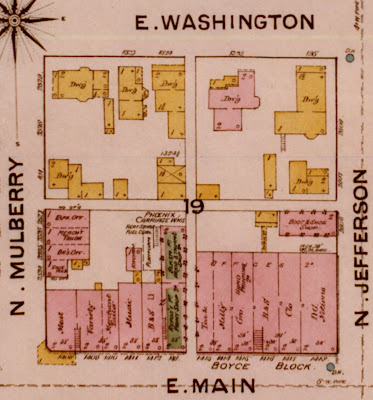 The map shown above is from the Muncie Sanborn Fire Insurance Maps collection available in the University Libraries’ Archives and Special Collections and from the Digital Media Repository. These maps are an excellent starting point for researchers interested in the history of local buildings and neighborhoods. For more information, contact John B. Straw, Assistant Dean for Digital Initiatives and Special Collections in the University Libraries and Executive Secretary of the Friends of the Alexander M. Bracken Library at 765-285-5078.